Steeped in a rich and vibrant history of service and growth, St. Francis of Assisi has been serving the needs of Catholics for almost 125 years and welcomes young and old from all walks of life into our faith and social community. St. Francis prides itself on being a family-friendly church. We believe that all members of our church community are important to the celebration of the Eucharist. We invite you to learn more about the parish by exploring this website. 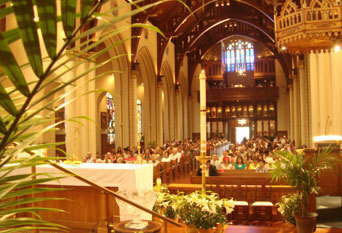 Please visit the “Our Parish” section to learn more about the church and its rich traditions. You can also learn how to exercise your stewardship of time and talent in one of the wonderful parish ministries by visiting the “Parish Ministries” section. Some of the many ways that you can become involved include: being an Extraordinary Minister of Holy Communion or Lector, singing in our choir, serving the needy through the Ministry to the Poor, or by joining our Senior Associates group. For the youngest members of our parish family, opportunities to get involved include serving Mass as altar servers and Children’s Ministry, a group which coordinates a variety of activities including weekly Children’s Liturgy of the Word, Christmas Nativity Program, and May Crowning. We invite you to join our parish community by filling out the online registration form. Someone from our Newcomers Group will contact you shortly thereafter. As one family we come together to know, love, and serve the Lord as instruments of his peace. Thanks for visiting and please check out our Facebook page!